Cosmetics: Do You Really Get What You Pay For? No, the saying “you get what you pay for” is not currently true in the cosmetic industry. Words like “natural,” “chemical free,” “organic” or products labeled by industry as “best products,” “best sellers,” or “best brands,” are not always true. U.S. Federal law allows companies to leave many chemicals off labels, including nanomaterials, ingredients considered trade secrets, and components of fragrance that contain harmful chemicals. As consumers, we are often led to believe that we are buying a very expensive product that will do wonders for us. However, we are often not knowledgeable about reading labels and linking ingredients to cancer causing agents. Although we may be purchasing a very high end product, we may also be contributing to the decline of our health by the ongoing exposure of chemicals on our skin that invade our bodies. Just because it smells good doesn’t mean that it is good for your skin. Most fragrances are synthetic origin, many toxic or carcinogenic (causing or contributing to cancer). Fragrances affect the central nervous system and cause depression, hyperactivity, irritability, and other behavioral changes. The label of “Fragrances” can mean a multitude of synthetic and toxic chemicals. When looking for something that smells good, make sure it’s scented by essential oils. This chemical is found to reduce sperm cell count in animals and is currently under review by the EPA. This is well known as petroleum jelly and is a mineral oil used in various cosmetics. It has no nutrient value for the skin and can interfere with the body’s own natural moisturizing mechanism, leading to dryness and chapping. Companies produce petrolatum because it is super cheap. Color makes things look good but they may not be good for the skin. The colors are often synthetic colors made from coal tar, containing heavy metal salts that deposit toxins onto the skin, causing skin sensitivity and irritation. They will be labeled as FD&C or D&C, followed by a color and a number. Example: FD&C Red No. 6 / D&C Green No. 6. Many synthetic colors can be carcinogenic. This is a carcinogen that is prohibited for us in cosmetics in the European Union. It is found in dandruff shampoos, hair dyes, and anti-itch creams. This chemical makes shaving cream smooth, but research links it to neuro-toxicity and neuro-developmental disorders, as well as to asthma and allergies. It is also found in nail polish, perfume, and hair spray. Hair straighteners can contain as much as 10 percent pure formaldehyde despite the cosmetic industry’s own scientific advisory board opposition to this cancer causing agent and warning about formaldehyde-based hair straighteners. Companies that include this in their products are listed here (click). This is found in things that foam. They are known to cause inflammation of the skin. These hormone-disrupting chemicals are already restricted in Europe due to known carcinogenic effects. They were sited for causing cancer. Causes cancer and is noted by the EPA as a pesticide. These are petroleum plastics that easily go through the skin and may weaken protein and cellular structure. This one ingredient is so common in everyday skin care products. It stops the body from being able to eliminate toxins, promoting acne and other disorders. It slows down skin function and cell development. Stop putting this on our babies and use more natural items such as organic virgin coconut oil or organic virgin olive oil. Article Commerical–Wow, you are still here reading. This is awesome. Do you know that the average person has an attention span of 8.25 seconds. It is an honor to have you on this page. If our information is useful, please like our Facebook page (click). We need to know people like you who read. (smile). Ok, continue reading below. Despite the health impact of these chemicals, the United States has more than 500 products sold that contain ingredients banned in cosmetics in Japan, Canada or the European Union. In addition, nearly 100 products contain ingredients considered unsafe by the International Fragrance Association. Also, 22% of all personal care products may be contaminated with the cancer-causing impurity 1,4-dioxane, including many children’s products. Over 60% of sunscreens contain the potential hormone disruptor oxybenzone that penetrates skin and contaminates the bodies of 97% of Americans. Lastly, 61% of tested lipstick brands contain residues of lead. Unlike the United States, the European Union (EU), now comprised of 25 countries, has more protective and stringent laws for cosmetics. In fact, EU Cosmetics Directive (76/768/EEC) bans 1,328 chemicals from cosmetics; the U.S. FDA has banned or restricted only 11 of those 1,328 chemicals. One state that has taken a lead in banning chemicals from products is California. In 2005, California became the first U.S. state to pass state legislation governing the safety and reporting of cosmetic ingredients. Read about the dangerous specific ingredients here (click). As a result, the California Safe Cosmetics Act requires manufacturers to disclose to the state any chemicals that cause cancer or birth defects. This database is open to the public. The state took action on a company called Brazillian Blowout during November 2010 when it filed suit for high formaldehyde content in its hair-straightening products. As consumers, we should assist the US Federal Drug Administration (FDA), the agency charged with oversight of cosmetics, by encouraging Congress to pass more stringent requirements. As of today, FDA has no authority to require pre-market safety assessments (that are often done with drugs, medical devices, and biological items). Therefore, cosmetics are among the least-regulated products on the market. The fact is that 89 percent of all ingredients in cosmetics have NOT been evaluated for safety by any publicly accountable institution. 7) Adequate funding to the FDA Office of Cosmetics and Colors so it has the resources it needs to provide effective oversight of the cosmetics industry. Article Commerical–Wow, you are an awesome reader. We appreciate still having your attention. If our information is useful, please like our Facebook page (click). We need your likes. (smile). Ok, you are almost done this long article. I think that the author had tons to say. Although the Safe Cosmetics Act did not pass Congress and become a law, companies such as Safe Cosmetics are diligently working to get like legislation before Congress. View their website for the latest updates on the Personal Care Products Safety Act, and continue to support companies promoting natural and chemical free products. Be sure to check the product ingredients for verifications and ask questions. Also, check for recalls of products that are found to be dangerous after distribution. With enough consumer complaints, they often land on the recall list. Lastly, realize that not all companies are buying into getting certified as Natural due to the pricing that goes along with the process and the information that must be shared about the natural product ingredients. Not all companies want to disclose “all” of their natural ingredients and not all companies trust those doing the certifications of brand secrets. Therefore, always always always look at the “ingredients” before purchasing a product. The author, Tamikio Bohler, graduate of Goucher College (BA-1990) and Georgia State University, (MPA-1993) has worked over 26 years at federal regulatory agencies such as the the US Centers for Disease Control and Cancer Prevention (CDC) and the US Environmental Protection Agency (EPA). Such agencies provided her with knowledge about research, chemicals, health impact of chemicals, and the value of natural ingredients. Her use of her own products have also helped her to maintain great skin at almost 50 years of age. 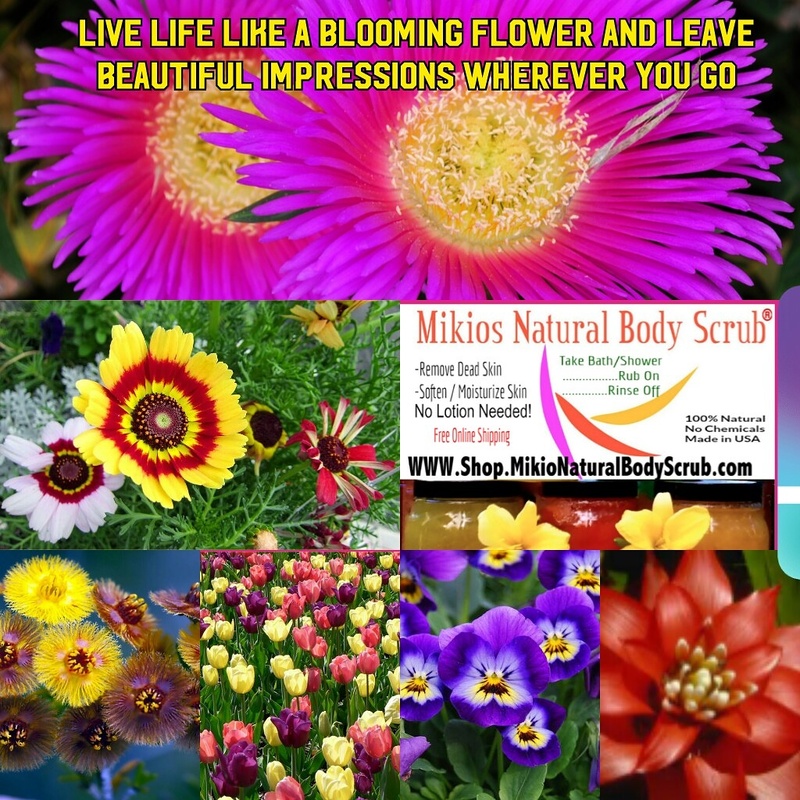 She is the creator and owner of Mikios Natural Body Scrub where she makes and sells her own line of epsom salt body scrubs that include Epsom Salt, Organic Olive Oil, organic essential oils, natural honey, and organically grown plant extracts. Ms. Bohler, a native of New Jersey believes that as American consumers our natural products should not cost so much. Therefore, her line of body scrubs (available to retailers starting January 2018) all come with free shipping, are large jars (1.2 pounds) at under $22.00 total, and only contain the best ingredients. Thank you…we appreciate your following, likes, and comments. Have a great day. This entry was posted in about body scrub, antioxidant foods, antioxidants, article commercial, Bath & Body, bath and body scrub, beauty, beauty coupons, body scrub, bodyscrubs, cancer prevention, chemical free products, contest, coupons, cure dry skin, epsom salt, Epsom salt body scrubs, FDA, health and beauty, health benefit of body scrub, healthy skin, Mikios natural body scrub, natural product, natural product ingredients, organic body scrubs, organic ingredients, product ingredients natural, safe cosmetics, send a gift, skin and health, skincare, tamikio bohler, top rated body scrub and tagged about mikios natural body scrub, all natural, Bath and body scrubs, chemical exposure, christmas gifts, followers of mikios natural body scrub, gifts for her, gifts for him, health america, Mikios Natural Body Scrub, natural body scrub, skin health, skincare. Live Life Like A Blooming Flower And Leave Beautiful Impressions Wherever You Go! 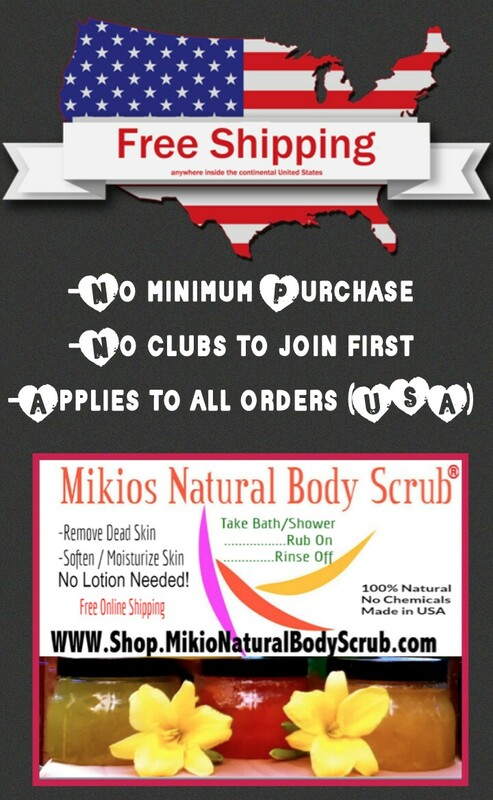 This entry was posted in 100 % free shipping, about body scrub, bargains, bath, Bath & Body, bath and body scrub, beauty, body scrubs, chemical free products, deals, Dr. Sebi, epsom salt, free stuff, gifs for her, gifts for her, gifts for him, health and beauty, healthy america, healthy skin, Mikios natural body scrub, natural, natural products, organic ingredients, shop online and tagged about mikios natural body scrub, all natural, bath and beauty, Bath and body scrubs. Shop christmas gifts for him or her this holiday season. Free shipping. This entry was posted in 100 % free shipping, Bath & Body, bath and body scrub, Body Scrub, body scrubs, gifts for her, gifts for him, shop online, skin and health and tagged Bath and body scrubs, christmas gifts.